BeefBread & PastaDoughMeat & PoultryPockets, Wraps & TortillasU.K. Originating in Cornwall, England, the “pasty” is a British staple that made its way over to the U.S. when Cornish miners settled in Michigan in the 19th century, bringing with them their culinary traditions. Consisting of a meat and veggie-packed pocket, the dough is perfectly buttery and flaky – without being overwhelmingly so – and excellent for an on-the-go lunch or snack. The key to the dough is to use both butter and shortening (lard is even better); this gives the dough its rich flavor and flakiness, while still keep it sturdy and easy to transport. 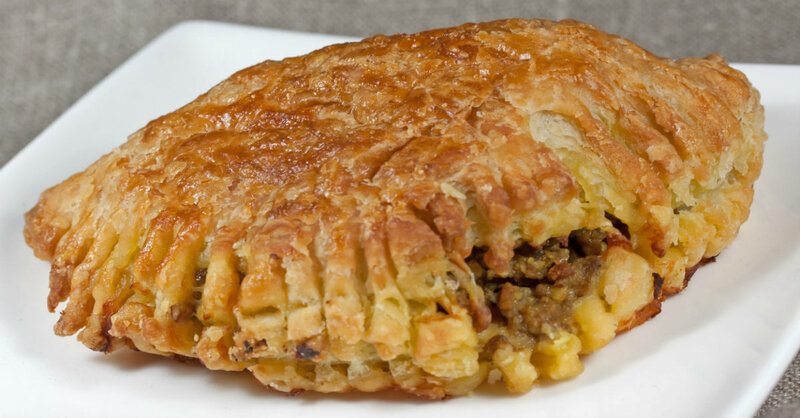 The result is a portable pocket of comfort food that will warm you up and make you feel at home, no matter where you’re enjoying it…check it out and see for yourself! In a bowl or directly in your food processor, mix flour and salt together before adding in cold, cubed butter. Pulse for 10-15 seconds, or until mixture is crumbly and butter is the size of small pebbles. With the motor running, slowly drizzle in 2/3 cup ice water and pulse until dough ball begins to form. Note: if mixture is too dry, add more ice water, 1-2 teaspoons at a time. Once dough is formed, turn it out onto a lightly floured surface and roll it into a large, flat rectangle. Wrap dough tightly in plastic wrap and refrigerate 30-45 minutes, or until chilled. While dough chills, combine beef with potato, turnip, carrot and onion, and season generously with salt and pepper, thyme and rosemary. Remove dough from refrigerator and cut it into 6 equal pieces. On a floured surface, roll each piece out to an 8-inch circle. Spoon 1/2-2/3 cup beef mixture into the center of dough, then top with 1/2 tablespoon butter. Take the far edge of your dough circle and fold it over the beef, towards yourself, to form a half moon. Seal edges with a fork and repeat with remaining pasties. Transfer to lined baking sheet and brush the tops of dough with beaten egg. Bake for 20 minutes, or until lightly browned, then lower oven temperature to 350º F and bake for another 15-20 minutes, or until golden brown. Serve hot with brown mustard and enjoy!